Is your asphalt driveway cracked, faded, stained, or otherwise not showing off the true beauty of your home? A cracked driveway is not only unsafe, cracks will only widen over time. And faded, stained driveways are unsightly and bring down your home's value. With materials and tools purchased at your local home center, you can repair those cracks and seal the entire driveway for a nice, fresh, black like-new appearance again. Instead, this is a minor do-it-yourself asphalt driveway crack patching and surface sealing project. This is a cold method in which unheated, ambient temperature substances are used to fill cracks and holes. After patching, an overall sealant, also unheated, covers the entire driveway. After completion, your driveway will look new and black, especially from a distance. Up close and at certain angles, the crack and hole patches will be visible below the sealant. The sealant itself will have a slightly shiny appearance. Anyone who can lift 50 pounds and is in reasonably good shape can finish this project in one weekend. A 5-gallon bucket of driveway sealer will cover about 350 square feet. Avoid applying sealer in extremely hot or cold seasons; instead, aim for moderate temperatures between 65 and 90 degrees Fahrenheit. By hand or with a string trimmer, remove weeds sprouting through the cracks. Use a screwdriver or trowel to remove rocks, dirt, and other obstructions. Bring down the level of any dirt or gravel in the cracks so that they do not protrude over the surface. Clean oil off of driveway with the oil cleaner if you have stubborn stains. Apply the asphalt cleaner, then thoroughly pressure-wash the surface. Wait until the driveway is completely dry. As with other projects where a coating is applied, a good cleaning assures that the asphalt sealant will adhere better. If you have large holes that need filling, use the cold asphalt patch. This dense material pours straight from the bag, no heating required. Curing times vary, so consult the bag for instructions. Apply the asphalt crack sealer to the cracks. Elastomeric sealers have a rubberized texture and will expand and contract with the driveway. 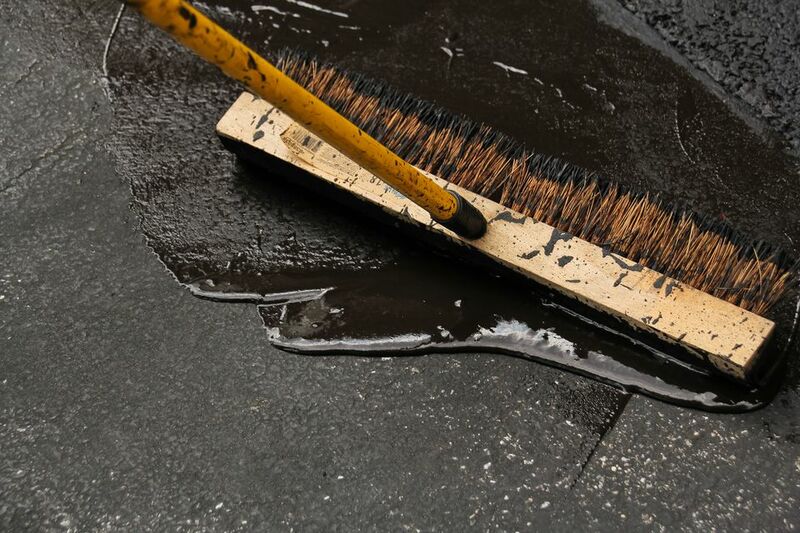 Seal the driveway by using the squeegee to spread the asphalt sealer in a series of passes parallel to the house. Let the sealant dry according to product instructions. After the first coat has cured, seal the driveway again by using the squeegee to spread asphalt sealer in a series of passes perpendicular to the house. Let this second coat dry according to product instructions. Generally, you will need to wait up to 48 hours before driving a vehicle on the sealed driveway. Asphalt driveway sealing will not cure ripples and bumps. Driveway sealing means putting down a thin layer of liquid sealant that conforms to ripples and bumps and is different from true asphalt paving. When pressure-washing, make sure that all water is moved off and away from the surface. Otherwise, the debris will remain on the driveway. You may choose to purchase hot-applied crack filler like Latex-ite Pli-Stix (requiring the use of a butane torch). Hot-applied crack filler tends to have a longer lifespan than the cold-applied product but can be more difficult to apply correctly. The trick to achieving a smooth finish free of brush strokes is to use the checkerboard technique, being careful not to vary from this. Even though the term checkerboard describes the process, the resulting finish will not have a checkerboard pattern if done correctly.